L. Furius Philus was one of the moneyers for the year 189-180 BC. He later served as Praetor in 171 BC. Gens Furia, originally written Fusia, was one of the most ancient and noble patrician houses at Rome. Its members held the highest offices of the state throughout the period of the Roman Republic. The first of the Furii to attain the consulship was Sextus Furius Medullinus in 488 BC. The cognomina of this gens are Aculeo, Bibaculus, Brocchus, Camillus, Crassipes, Fusus, Luscus, Medullinus, Pacilus, Philus, and Purpureo. The only cognomina that occur on coins are Brocchus, Crassipes, Philus, and Purpureo. Purpureo, "rosy", probably referred to a person's complexion. 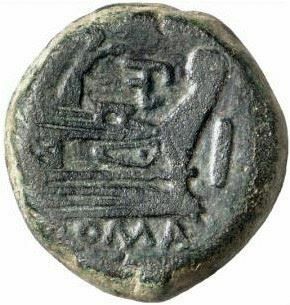 The nomen Furius is a patronymic surname derived from Fusus, apparently an ancient praenomen that had fallen out of use before historical times. This name was preserved, however, as a cognomen used by many of the early Furii, including the families of the Medullini and the Pacili. Cossus, a surname of the gens Cornelia, which they later revived as a praenomen, may have had a similar origin.